This Post has already been read 1444 times. PTCL has recently launched its 3G EVO nitro wireless Broadband service in the Rawat Industrial Estate, near Rawalpindi. President Rawalpindi Chamber of Commerce & Industries (RCCI), Mr. Javed Akhter Bhatti inaugurated the state-of-the-art wireless broadband services of PTCL EVO nitro in a colorful ceremony held at RCCI Industrial Estate, Rawat. PTCL’s Executive Vice President Estate Management, Mr. Kanwar Ghulam Mustafa and General Manager Wireless, Mr. Wajeeh Anwer, were also present on the occasion. “PTCL’s 3G EVO wireless Broadband is the only wireless broadband network providing Rev A and Rev B connectivity in Pakistan,” said PTCL, MR. Kanwar Ghulam Mustafa while addressing local industrialists gathered on the occasion. 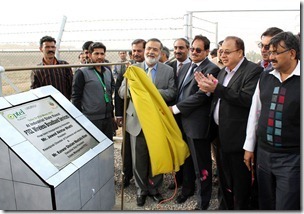 President RSSI, Mr. Javed Akhter Bhatti thanked PTCL for connecting the Rawat Industrial Estate with 21st century’s Information Super highway, noting that it will yield a much-needed boost in Rawat’s industrial productivity.